Welcome to Flora-Bama Marina! Located on the Florida-Alabama line on beautiful Ole River, Flora-Bama Marina is home to Orange Beach, Gulf Shores and Perdido Key family fun in the sun. Jet ski, pontoon boat, paddle board, kayak and bay boat rentals are all here! All rental equipment is maintained with the highest standards. You can be assured that your rental will be clean and all Coast Guard rated safety equipment will be provided and explained in detail. 4 hour, 5 hour and 6 hour fishing charters are ideal for families wanting to make memories together that will last a lifetime. A 4 hour near shore trolling charter is the perfect duration for small families with young children. King Mackerel, Spanish Mackerel, Bonita and Redfish are typically what are targeted on a 4 hour trip. A 6 hour, half day family fishing charter will travel farther offshore where bottom fishing, or deep sea fishing, will be the means of fishing. 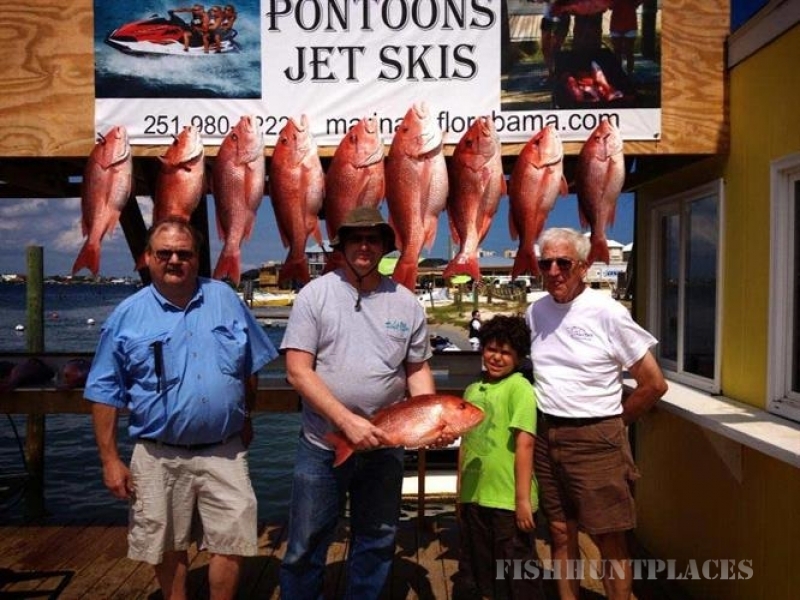 Red Snapper, Vermillion Snapper, Black Snapper, Lane Snapper, Triggerfish, King Mackerel and Cobia are the main targeted species. A family can expect two hours or less of a ride out to the fishing grounds, two hours or more time spent fishing and two hours or less of a ride back to port. A 5 hour half day trip is a combination of bottom fishing and trolling. This is a great option for families that are wanting to go for the first time and are not sure what to expect. If your priority is take home as much fish as possible, please consider an 8 hour charter or longer. Please note, the availability of each species for harvest is dependent on federal and state regulations. 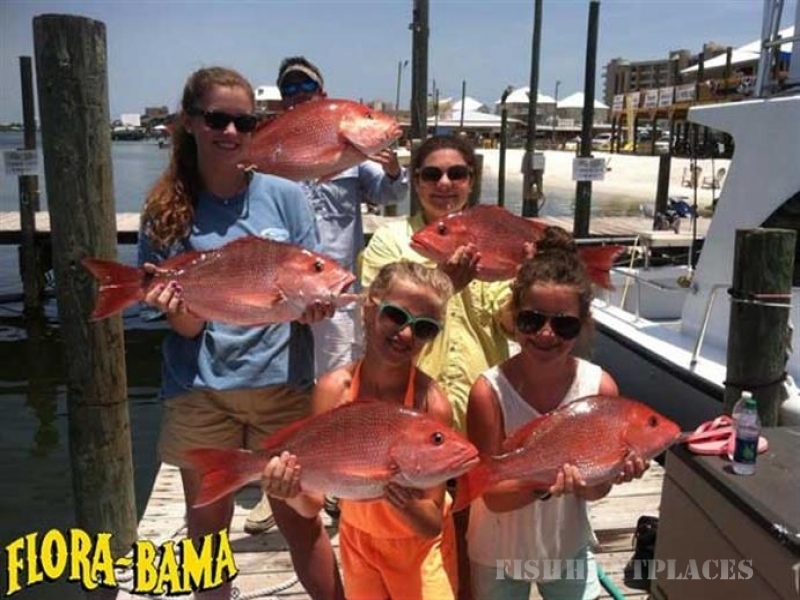 8, 10 and 12 hour charters are available for groups of all sizes are the Flora-Bama Marina. 8 hour charters allow anglers to target a larger size grand more of the species available in a 6 hour charter, plus Amberjack. 10 and 12 hour charters allow the range to target grouper and other deep-water species that cannot be reached on shorter trips. This is for the more serious, experienced fishermen and families. Inshore and back bay fishing charters are offered in 4, 6 and 8 hour durations. Speckled Trout, Redfish, Flounder, Black Snapper, Sail Catfish, King Mackerel, Spanish Mackerel, Sheepshead, Pompano and Black Drum are all targeted in the back bay waters of Orange Beach, Gulf Shores and Perdido Key. All of these species are migratory and their availability changes with the seasons. For parties of 4 or less, a shared expense trip, walk-on or split trip is a way to enjoy the private charter experience at a per-person rate with other small groups that want the same experience. This is NOT a party boat. Although you do not get to choose the boat, you are guaranteed that a reasonable and manageable number of people will be on board to ensure your comfort. After placing your reservation, you will be contacted the day before your scheduled departure to let you know how many people will be on board, which boat you will be fishing with, your departure time and any other pertinent fishing trip details. The party boat at Flora-Bama Marina is the Miss E. It is a 65 foot Bonner that can comfortably fish 44 fishermen at a time. The party boat is a great introduction to deep sea fishing. This may not be the ideal charter for the avid fisherman. Depending on demand and availability, the Miss E offers a 6 hour morning trip and a 4 hour afternoon charter. 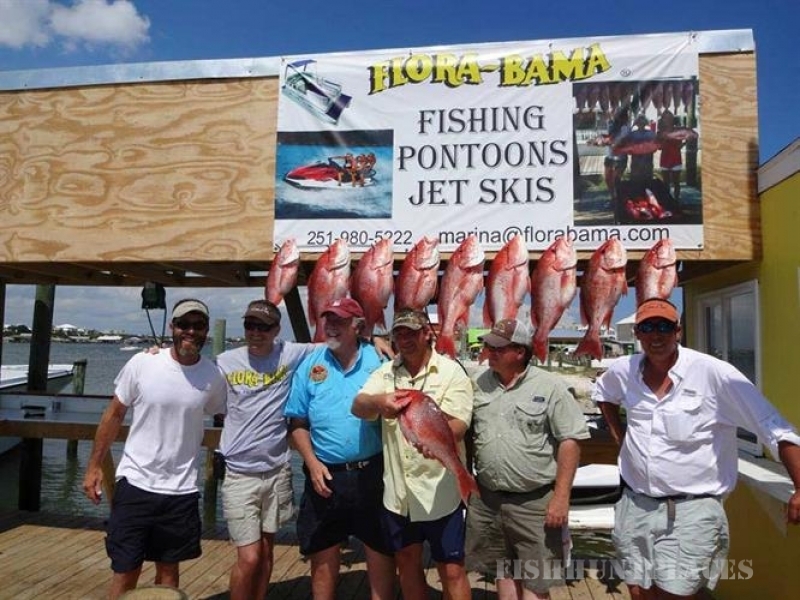 Flora-Bama Marina offers the cleanest pontoon boats and jetskis in Orange Beach, Gulf Shores and Perdido Key. The marina is not located in a no-wake zone. This means that once you and your party leave the dock, you can speed up without having to idle for a portion of your rental time. Bentley pontoons with new Mercury 4-stroke, 90 horsepower motors and Yamaha Waverunners make Flora-Bama marina the clear choice for your summer fun in the sun rental watersports rentals. Flora-Bama Marina is the perfect location for renting paddleboards and kayaks. The beautiful waters of Ole River are native to dolphin and a wide variety of wildlife. These calm, back-bay waters are perfect for all levels of experience. Our friendly staff will make sure that you are prepared with the appropriate safety equipment and pertinent knowledge of the local waters before your paddle adventure. BOOK NOW by calling (251) 980-5222, by email marina@florabama.com, or in person!